I refer you to three articles concerning ped's and genetics. 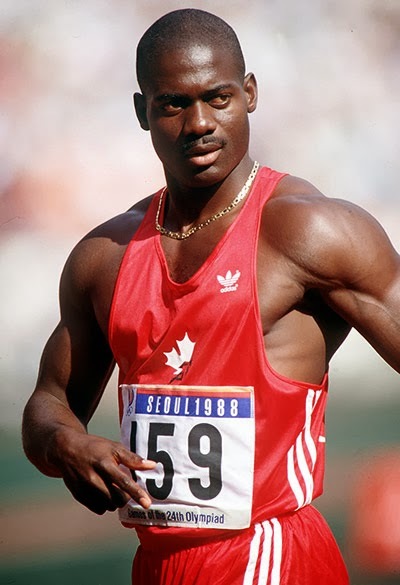 Last week was the twenty-fifth anniversary of Canadian Ben Johnson's disqualification at the Seoul Olympics. 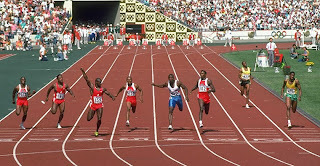 The first article concerns that 100 meters in 1988. The second article is an interview in The New Yorker written by Malcolm Gladwell with Ben Epstein who has recently published a book The Sports Gene on sport, genetics, and drugging. I must admit it has caused me to think some more about this era in sport and what it means to partake in fair competition vs. the drive for fame and riches. The third article is from the Vancouver Sun recalling that 1988 100 meters and how it affected Canada. We could editorialize on these subjects, but we leave it to you to peruse and digest. Most of us old timers wish that track and field could be like the old days ie. 1950's and 60's. But we cannot turn back to an era that no longer exists. One of the hard facts of "growning old". In our last report we promised you two world records and the return to competition of one of the icons in the sport. That is coming up. But first let's go to Santa Barbara for the Easter Relays on March 28 where there are many fine early season marks and almost a collegiate record. Remember the sloppy officiating in the indoor meets reported in the March issue? Well the outdoor season isn't starting any better. Fresno State's Charles Craig is the victim. He triple jumps 52-1½ to better the 51-9¼ collegiate record set by Luther Hayes of USC in 1962 but there is no wind gauge. Whoever was in charge of the gauge had taken it home. While it was in use it had recorded only one race in excess of the limit and witnesses say the wind was minimal at the time of Craig's jump but without a wind reading, record recognition is doubtful. The mile relay is won by the Camp Pendleton Marines in 3:08.9, the fastest time of the season. One second back are the Striders who are handicapped by a 49.2 lead off leg from Mike Larabee. 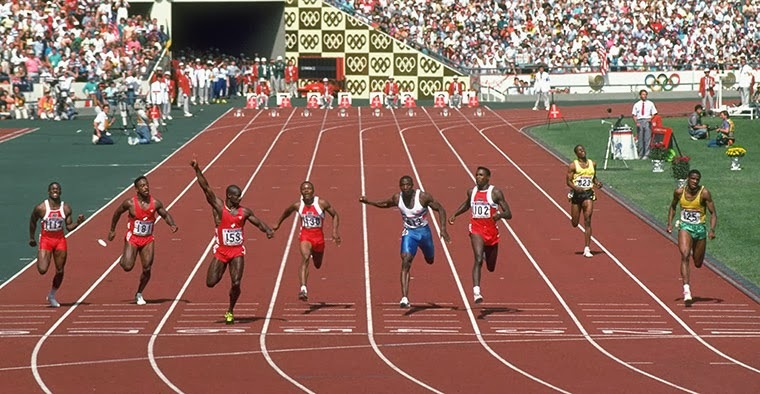 The Striders beat the LATC in an unremarkable distance medley, unremarkable except that the lead off man for the Striders is comebacking Olympic 400 champ, Otis Davis, who eases into his season with a 48.6 split. The best race of the day is the 880 relay where Adolph Plummer of the Striders takes the baton five yards down to Darryl Newman of Fresno State and blows by to win by three with a 20.4 split. Things heat up the next week with three solid meets. The Texas Relays are held on April 3 and 4. In what is the only open division race, Ollan Cassell clocks the fastest 440 this year, 46.6. 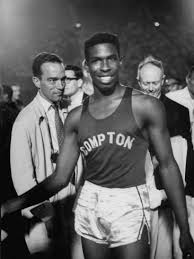 Perhaps more significant is the second place 47.0 of high schooler Blendon Johnson who beats established stars Earl Young, Ted Nelson and Ray Saddler. LSU's Billy Hardin, son of 1936 Olympic champion Slats Hardin, shows genetics weren't wasted on him as he blisters the 400IH in 50.8 to top the world list. In the frosh-junior college division Texas A&M freshman Randy Matson opens eyes with an amazing PR of 62-11½. As good as those marks are, the star of the day is Missouri's Robin Lingle. Lingle, a transfer from the US Military Academy, anchors the Tigers to wins in the two mile relay and the distance medley with splits of 1:48.3 and 4:02.3 in posting the year's fastest times, 7:22.3 and 9:45.2. He is voted athlete of the meet. In 1964 when an athlete wanted to continue competing after his college career had ended there were three choices: join the service and compete for the Marines, Navy or Army, join a club or compete unattached. The first required a serious commitment. The last required the expense of getting to meets. Club teams flourished. The Grand Street Boys Club, the Pasadena AA, the Striders, the Santa Clara Valley Youth Village, the Pacific Coast Club, the San Francisco Olympic Club, the LA Track Club provided coaching and travel and thus were the choice of many post collegiate stars. On April 4 two club teams had dual meets with colleges. The Pasadena AA took on nearby Occidental and the Striders traveled to Tempe to run against college powerhouse Arizona State. Whereas the PAA-Oxy meet was the lesser of the two, no one went home disappointed after witnessing the performance of shot put record holder Dallas Long. As you may remember, Long is in dental school at USC, a commitment that kept him from competing until the last two weeks of the season last year. Although he produced the best mark in the world, 63-9, it was only by and inch and one had to wonder whether his cloak of invincibility is gone. That doubt is erased this afternoon. In his first meet of the year Long throws over 65 feet three times and his 65-11½ breaks his world record by an inch. Long is surprised, “I felt like I was in the twilight zone, it came so easy”. 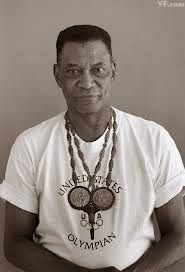 Now we are in Tempe where ASU's 220 world record holder, Henry Carr, takes the baton in the 440 relay well down to the Strider's Adolph Plummer. Though he doesn't catch the 440 record holder, he gives an indication of what is to come by gaining five yards. 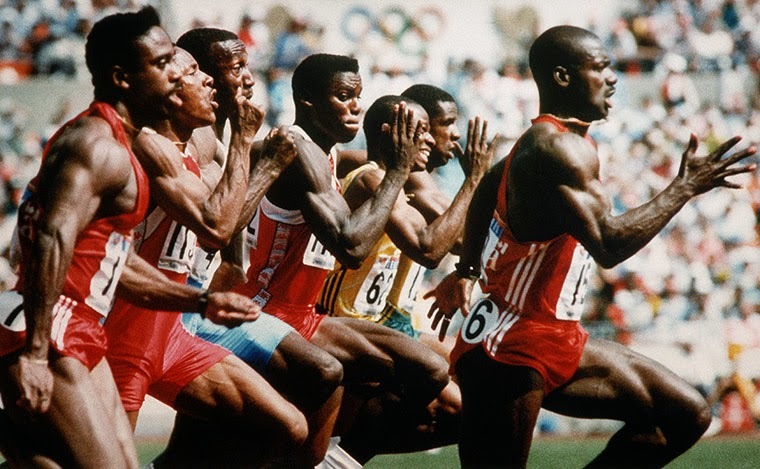 Minutes later he is in the blocks for the 100. Gerry Ashworth of the Striders leads for 80 yards but Carr comes on strong at the end to win in 9.5 for both. This victory is not without cost. The Arizona State star suffers a “muscle injury” during the race. Henry Carr is the odds on favorite for the Olympic gold at 200 meters in six months. 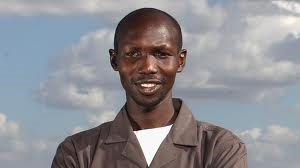 Indeed he is the only man to run faster than 20.5 with two 20.4s and his WR of 20.3. Obviously the wise thing to do is watch the rest of the meet from a spot on the infield. No, not Henry. He is a spit on it, rub a little dirt on it, get back in the game kind of guy. The 220 is coming up and he will take another shot at Adolph Plummer. For some reason they are in the lanes with the tightest curve, Plummer in one, Carr in two. This is no problem for the ASU star. He leads by four yards off the curve and increases the margin to six at the tape. The watches read 20.2. Once again the Detroit native has broken the record. Plummer's 20.8 is hardly noticed. And now for the return of the former world record holder and Olympic champion who hasn't competed since the 1960 Olympics. This would be Charlie Dumas, the first man to jump seven feet, but only a figure in history for the last four years. Where has Charlie's road taken him? After the Games he tried out for the San Diego Chargers but was cut early on. As he was never paid, his AAU eligibility was reinstated just last month. An effort to join the Marines had come to naught because of a bad knee. In the time that he was out of the track spotlight he returned to USC and earned his teaching credential. Now Charlie is employed by the Inglewood, CA school district. As satisfying as making lesson plans and grading papers may be, he has decided to give track one more shot. And what a shot it is. Not certain of his fitness, he opens at 6-0. As that goes well, he skips 6-2 before clearing 6-4, then 6-6, then 6-8. He misses at 6-10 but at this point he has to be happy with 6-8 in his first meet back. Not bad for an old timer. But Charlie is buying none of this old guy stuff. He clears 6-10. Now he is back in the Olympic team picture. With the bar set at 7-0½, all eyes are on him as he readies himself on the apron. Over he goes and the crowd erupts. Charlie D hisownself is back. He decides to end the evening on a high note and retires with a seven foot clearance in the books. Time to work on Monday's lesson plans. Good to have you back, Charlie. Oddly, there is no report of a meet on the weekend of April 11. We move ahead two weeks to the Kansas Relays held on the 17th and 18th. Robin Lingle proves his performance in the Texas Relays wasn't an aberration. He anchors the Missouri four mile relay team to victory with a 4:01.0 split on Friday and returns the next day to take the Tigers to the victory stand in the two mile relay in 7:26.6 with a 1:49.9 split. The college distance medley is won by Emporia State on the strength of a 4:02.3 anchor by John Camien. Richard Romo nearly matches that with his 4:02.5 anchor to bring Texas in second in the four mile relay. Jerry Dyes displays his significant decathlon potential by scoring 7059 to defeat veteran Phil Mulkey who scores 6961. Mulkey's 15.2 to 17.0 advantage in the hurdles is more than made up by Dyes' 249-1 javelin effort which puts him 63 feet ahead of Mulkey. Olan Cassell of Houston betters his yearly world best at 440 yards. His 46.4 gives him a full second advantage over Ted Nelson of Texas A&M. Apparently no meet would be complete without the mention of poor officiating. The 10,000 winner is John Macy in 29:49.0 with the parenthetical note that the race might be a lap short and that no other times are available. Under the heading of Profiles of a Champion we have two in hammer thrower Ed Burke and triple jumper Charlie Craig. Unfortunately their photos are transposed making Craig the thickest necked triple jumper ever. A check of the US Report listing the top marks in each event finds that Bob Hayes has equaled his own WR at 100 yards in 9.1....Jerry Siebert hasn't raced since the USSR meet in 1962. Jerry's work for a doctorate in physics has taken priority over training. 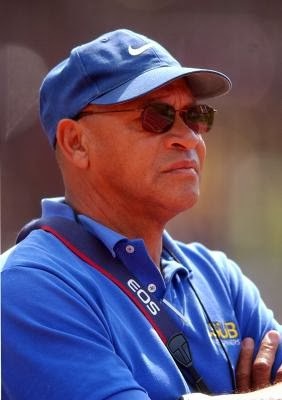 Yet on March 28, while at the track “to trot around”, he was talked into competing by coach Brutus Hamilton just 20 minutes before the start of the half mile. The former Cal star clipped off a 1:50.2 for the second fastest time in the country this year. 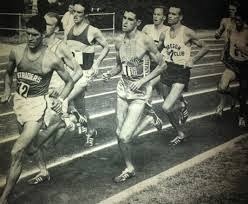 Still he says that the doctorate comes first and that he isn't considering a return to serious running and a shot at the Olympic Games......The national leader in both the mile and two mile is Bob Schul of Miami (OH) with times of 4:00.9 and 8:47.3. Coming up in the next issue are the major relay meets: Drake, Penn, Mt. SAC. West Coast (Fresno), Coliseum and California (Modesto). I spent the morning and part of the afternoon with my friends Steve Price and Phil Scott. Steve was for years the women's coach at Bowling Green State University, and Phil coached many years in the Midwest and most recently at Cedarville University. His son Jason is pushing 18 feet as a pole vaulter. Phil restores antique bicycles, was a national JC decathlon champ in the early 70's at Santa Barbara JC, and now lives in the Dayton, Ohio area. He is the collector of track shoes who was featured in the blog last year. 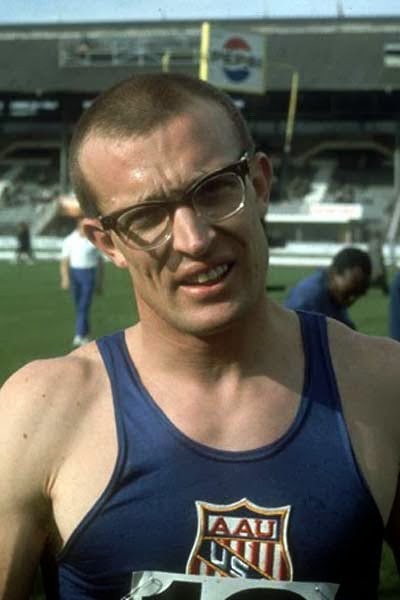 He is a fount of track stories, humour, wisdom, absurdity, and an unabashed raconteur. His mother once told him, "Phil, I only asked you what time it was, not how to make the watch." Below are some of the shoes Phil has collected over the years on eBay, by calling people up and charming them with his interest in them and his ability to demonstrate his profound track and field knowledge. In one instance Phil was talking to Ron Morris the bronze or silver polevault medalist in 1960. He learned that Ron had never seen any film of himself vaulting in the Olympics. Phil contacted the IAAF in Switzerland and borrowed video from them and got it copied and sent to Ron. He's always doing things like that and sometimes the favors are returned. He tells a story of working in a shoe department in Dayton and a lady, completely irate, came in to return a pair of Nikes. Her comment, "Don't even get me started. I'm so angry. There was no note in the box saying you could not put these in the washer and dry them in the dryer. Now look at them." Phil opened the box and found a pair of track shoes all dried up burnt, and twisted. He didn't know what to do. Finally the owner of the store came down to see what all the commotion was about, heard her story and replied, "Maman, there wasn't any note on your stove saying not to stick your head in the oven was there?" Phil in his basement, he's recovering from serious back surgery. That explains the brace. Phil with Bill Ashenfelter's shoe worn in 1952 Olympic Steeplechase. Bill's brother Horace won at Helsinki, Bill DNF'd. still vaulting and coaching at Cedarville University in Ohio, his alma mater. Phil is still trying to figure out what these shoes were used for. The have an inscription 'Wimbeldon' on the sole. Sole on the 'Wimbeldon' Tennis anyone? Restoration projects in another wing of the basement. antique bikes on this model. An early Lydiard. Phil thinks this is the lightest shoe ever made.